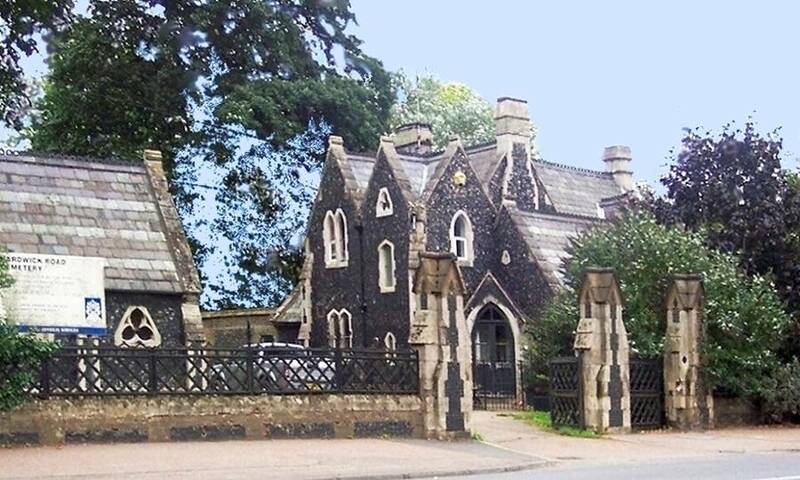 Lodge at the gates of the Hardwick Road Cemetery, King's Lynn. 1855-56; consecrated May 1856. 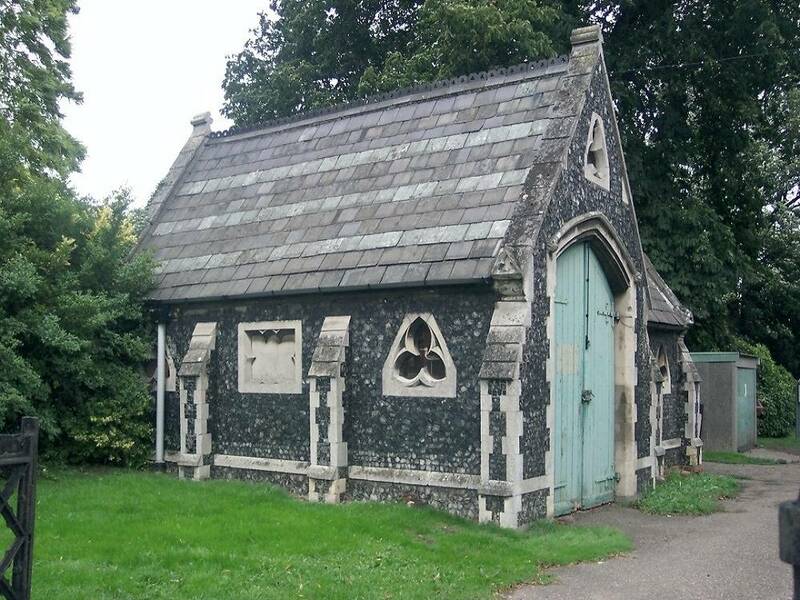 This is one of the cemetery buildings designed here by the London partnership of Aickin & Capes, that is, George Aickin (1822-1882) and Silvester Charles Capes (1825-1901). As well as the lodge, these buildings included Anglican and Nonconformist chapels linked by a carriage porch, and a mortuary. All were in flint with Casterton stone dressings, and blue and green slate roofs. There was a timber-framed, green-slated spire over the central arch of the chapels. Photographs kindly provided by Colin Houseman, Secretary of Friends of Hardwick Road Cemetery, who retains their reproduction rights. Captions and commentary by Jacqueline Banerjee, with considerable help from Dr Julian Litten, chairman of the same society and Fellow of the Society of Antiquaries. 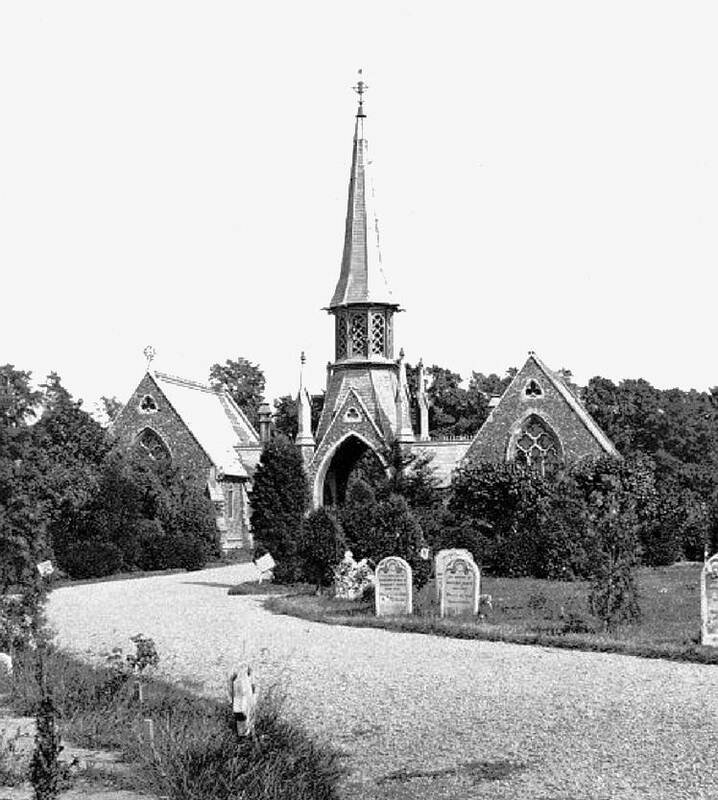 The two chapels during the late nineteenth or early twentieth centuries. They were demolished in 1972. Left: Seen from the cemetery gates. Right: Seen from the rear. Like other towns in England, this busy market town, a port on the estuary of the River Ouse, was running out of burial space in the late eighteenth century: "The need for a new burial ground was greatly felt," writes Henry J. Hillen (616). 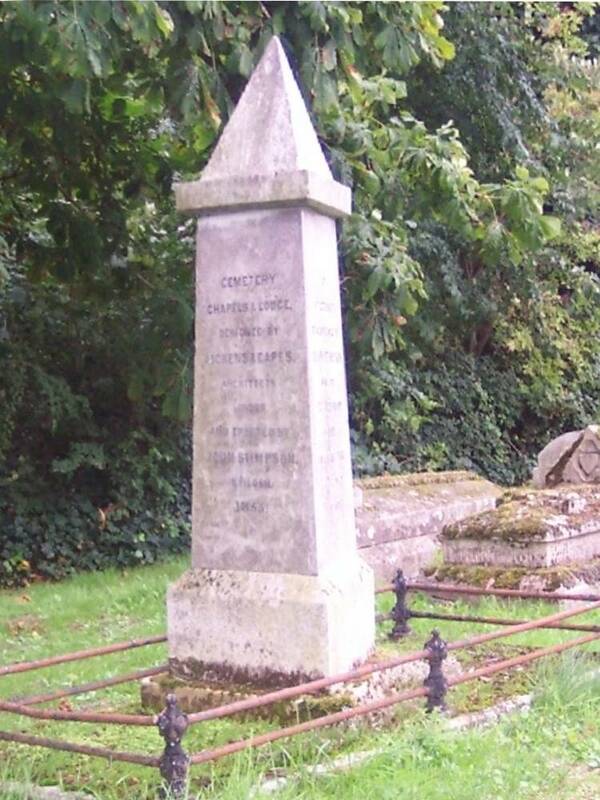 Here as elsewhere, the Public Health Act of 1848, and the Burial Act of 1854 which was a direct consequence of it, led to the establishment of a Burial Board, also in 1854. By then, South Lynn had already opened a new burial ground, designed by a King's Lynn architect, with a chapel designed by another local architect. This was consecrated in 1851. It was eventually decided that the new burial ground would adjoin it on land by Hardwick Road. This time, advertisements were put not only in five Norfolk newspapers, but also in The Builder, and among the twenty-five sets of drawings sent in, those of the London partnership of Aickin & Capes were selected. The success of this firm at the Kingston upon Thames cemetery reassured the Board that they had made the right choice. 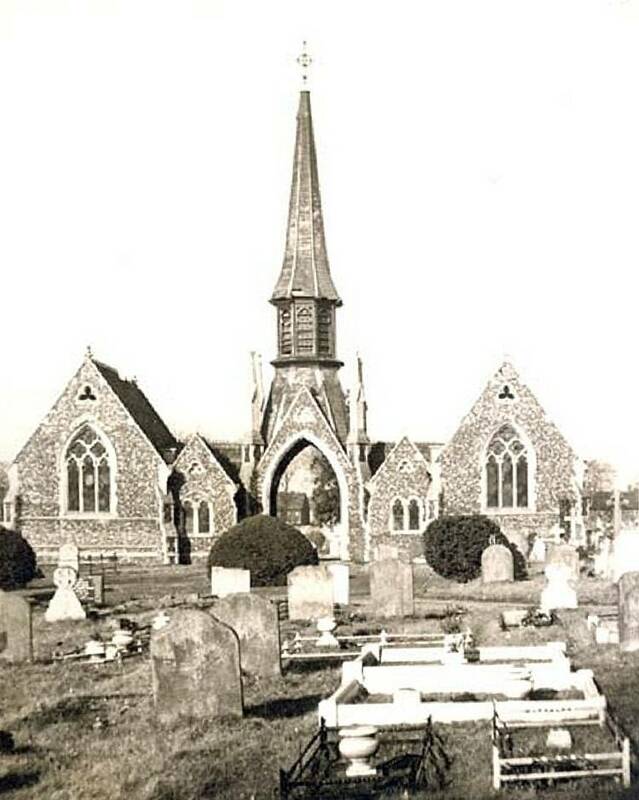 Sadly, the chapels first lost their central spire, and then were demolished completely in 1972. The Borough Surveyor at that time was quoted as saying that "the chapels are in a bad state. There is no point maintaining buildings which are just an expense" (Litten 37). Left: Hearse house and mortuary, no longer in use by the cemetery, but, like the lodge, at least still there. Right: Monument to John Stimpson, builder, 1855, including a reference to the architects. The inscription here reads: CEMETERY / CHAPELS & LODGE/ DESIGNED BY/ AICKEN [sic] & CAPES/ ARCHITECTS/ LONDON/ AND ERECTED BY/ JOHN STIMPSON/ BUILDER/ 1855. Hardwick Road Cemetery as a whole marked a milestone. Dating it from when the earliest part was laid out, it was "one of the first parochial cemeteries in Great Britain" (Litten 39). In general, what is left here now is rather typical of the period: see, for example, the entrance to Camberwell Cemetery, London, also completed in 1856, where the Lodge, piers and railings have now been listed. But the twinned chapels were more distinctive. The ones for which Aickin & Capes were responsible at Kingston (as yet unlisted) are not the only such chapels left in the country — see for example those at Twickenham Cemetery, or the more complex chapel group at Paddington cemetery. But they would still have been well worth preserving. The Hardwick Road Cemetery is also an important early example of cemetery landscaping, with its "variety of monuments" acting as "a bold reminder of the Victorian Way of Death" (Litten 39). Even though Aickin & Capes's principal buildings here have been demolished, their contribution to the cemetery deserves to be remembered, and perhaps it will be. Rutherford talks of "Friends groups as a force for restoration and re-use" (59), and fortunately this cemetery has a very active one. Hillen, Henry J. History of the Borough of King's Lynn. Norwich: East of England Newspaper Co., . Internet Archive. Web. 28 October 2012. Litten, Julian. "A History of Hardwick Road Cemetery, King's Lynn." Kindly provided by Dr Litten. Print. Rutherford, Sarah. The Victorian Cemetery. Botley, Oxford: Shire, 2008. Print.